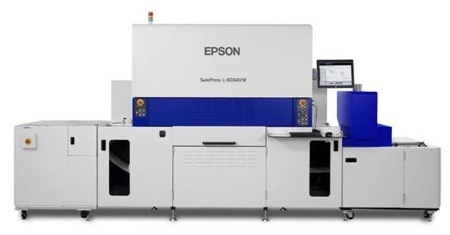 Brussels, Belgium – Epson America today expanded its digital label press product line with the introduction of the SurePress® L-6034VW. The L-6034VW is Epson’s first single-pass industrial press, the first to use Epson’s new PrecisionCore™ linehead technology, and the first to use Epson’s new LED-cured UV ink with in-line digital varnish technology. Available in two models – CMYK with digital varnish and high-opacity White ink (SurePress L-6034VW) and without white ink (SurePress L-6034V), the compact digital label press delivers precise quality with maximum reliability, flexibility and performance. The new PrecisionCore linehead is the key component behind the high performance, high reliability, low maintenance, and low running costs of the SurePress L-6034VW. Each of the six lineheads in the press comprises 11 PrecisionCore print chip modules (totaling 52,800 nozzles) that deliver precise quality with fine, multi-size dot control and high native resolution. The linehead is designed to work with Epson’s new low-energy LED-cured UV ink and in-line digital varnish technology to deliver the best combination of 600 x 600 dpi quality at up to 49.2 feet per minute with vibrant color, smooth gradations and ultra-fine text, lines and images. Developed and manufactured by Epson, the SurePress L-6034VW leverages an advanced, all-new UV ink technology to deliver a level of quality for UV ink printing previously unattainable for digital label presses in this price range. The press produces high-quality, short- to mid-run labels with outstanding durability on standard film and paper label substrates between 3.15 to 13-inches wide up to 0.013-inches (0.32 mm) thick. In addition, it enables printing onto heat-sensitive substrates, such as polyethylene (PE), maximizing the range of materials that can be used, and the curing process uses long-life LED lamps for lower energy consumption. The SurePress L-6034VW gives users the flexibility to print high-opacity White ink first or last to boost image impact on clear and metallic substrates, and to expand the variety of labels that can be produced. The press also includes an innovative digital varnish feature that enables users to save time and cost by applying matte, gloss or a combination of both in patterned or selective spot varnish effects during printing to achieve a range of finishes. This can be done on the same label or vary from label to label in the same print run. Epson has incorporated sophisticated automatic monitoring, maintenance and cleaning features within the SurePress L-6034VW. Unique to Epson, Nozzle State Analysis technology automatically senses if a nozzle is not firing and rapidly cleans and recovers it, which minimizes downtime, ink waste and ensures reliable and continuous printing. The Epson SurePress L-6034VW and L-6034V will be shown at Labelexpo 2013 from Sept. 24-27 in Brussels, Belgium (Hall 9, Stand 9H50) and will be shipping in summer 2014. For additional information, visit www.epson.com/surepress.